Food is not only essential for the survival of the body, but also for nourishing the soul, cementing culture, and celebrating the resilience of the human spirit. As such, food is much more than a biological necessity, but rather a reaffirmation of society as shared concern for each other which is central to human identity. So when natural and manmade disasters strike occasioning widespread humanitarian crisis, distributing tasteless MREs (Meals Ready to Eat, military shelf-stable field rations) and bags of dried food does next to nothing to comfort the victims by showing that the world really cares. “There is something fundamental about food; about preparing, cooking and eating together. It’s what binds us; it’s how we build community. Eating isn’t functional. Food relief shouldn’t be either.” So freshly made hot meals and even simple sandwiches made with quality ingredients and lashings of mayonnaise can reassure the afflicted that they are not alone in their suffering and that they will have help in rebuilding personal dignity and a civilized life. “A plate of food is much more than food . . . It’s a beacon of hope. An MRE is almost hopeless” and only meant to be the sole source of nutrition for short periods because of digestive repercussions! 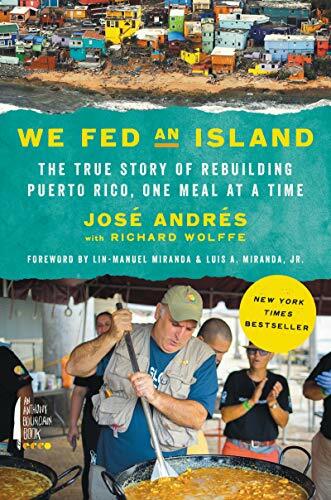 These two quotes are by renowned Michelin-starred chef and founder of more than 30 restaurants around the world José Andrés, from We Fed an Island: The True Story of Rebuilding Puerto Rico, One Meal at a Time, co-written with his frequent collaborator Richard Wolffe. The book is a highly readable blow-by-blow insider story of what a humanitarian crisis afflicting an island of some three million American citizens looked like on the ground and how a small nonprofit led by Chef Andrés managed to serve as many meals over a couple of months while US federal disaster agencies were still arguing over red tape around contract bidding protocols. In September 2017, Hurricane Maria ripped through Puerto Rico, an unincorporated territory of the United States, devastating the small island’s built landscape and natural resources while largely wiping out the electric grid. The economy was destroyed and most residents had to contend with roofs ripped off, no clean water, no food, no gas, and no way to communicate with the outside world. President Trump tweeted the usual commiserations and retreated to his Florida golf resort. Chef Andrés packed a small bag, withdrew all the cash he could from ATMs, bought satellite phones and emergency lamps, and headed to Puerto Rico on one of the first commercial flights five days after the hurricane made landfall. Chef Andrés, a naturalized American citizen born in Spain who never completed high school, has become America’s leading ambassador for humanitarian aid with an impressive record of organizing on-the-ground food services for millions in disaster relief. When catastrophe strikes, Chef Andrés is there, helping out the way he knows best: feeding people. And Chef Andrés has been spending as much time in disaster zones as in his restaurant kitchens in recent years. Via his small organization World Central Kitchen (WCK) which he set up after helping victims of the devastating earthquake in Haiti in 2010, he has coordinated a number of food aid operations abroad and at home. Chef Andrés initially expected to spend only a few days in Puerto Rico feeding those in need. On arrival, he pitched right in assisting his friend Chef José Enrique in his devastated small San Juan restaurant serving up helpings of sancocho, a traditional stew, to the neighborhood. A week after Hurricane Maria struck it was clear that almost the majority of the population of Puerto Rico was in desperate need of food aid and that Chef Andrés would be staying for the long haul as the island remained without power, roads were impassable, hospitals and clinics were closed or barely functioning, fuel was short, people were getting water from polluted creeks and had little to eat with no way to cook it. The lack of leadership shown to a people in the midst of an humanitarian disaster was epitomized by the viral image of the visiting American president in a warehouse filled with packaged hurricane relief supplies pitching paper towels at the Puerto Ricans “like he was shooting a basketball at an imaginary hoop” while he continued to downplay the official death count as opposed to a “real crisis” like Hurricane Katrina. It was clear that the president regarded the islanders as second-class Americans without full statehood who were a debt burden on the mainland, rather than a colonized people who had never had a chance to develop self-sustaining economic viability. In particular, relief efforts were hamstrung by strict adherence to the 1929 protectionist Jones Act which allowed only five American container ships to supply the island while federal military resources such as helicopters and carriers were not fully deployed. According to Chef Andrés, the whole official disaster relief operation was paralyzed by the inflexible and archaic top-down, paramilitary-style operations model exemplified by FEMA (the Federal Emergency Management Agency) that was so bogged down in red tape that it was unable to take advantage of locally available resources. This made it prone to cronyism and brokers seeking to get rich from human suffering as well as to ill-equipped contractors who never delivered. Andrés himself was only able to secure a couple of short-term contracts for meal provision though he worked up to delivering 100,000 meals a day while the Red Cross, FEMA’s charity partner, did not deliver any except packaged products and bottled drinking water, in itself an environmental disaster. And Andrés was never given official clearance to attend FEMA meetings! Andrés achieved this remarkable feat though a successful chef-restaurateur’s mastery of food system planning and knowledge of likely locally available resource stocks, such as Wal-Mart and island bakeries, together with the sheer force of his energetic and outgoing personality, his big heart, a can-do attitude, and his networking talents honed in the Iberian tradition of patron-client relations as well as his social media skills. So within a few days of arriving in San Juan, Andrés managed to put together a dedicated team of local chefs and volunteers, which expanded to occupy the massive kitchen of the Coliseum arena. From this base, the team produced homestyle meals of arroz con pollo and other local favorites in giant paella pans, distributed via food trucks, churches and various community organizations taking hot meals to hospitals, homes for the elderly, remote villages and so forth. In addition, a dozen satellite kitchens were set up around the island in existing facilities such as local schools and restaurants. The only reward Chef Andrés needed was the satisfaction of seeing afflicted Puerto Rican beneficiaries exulting in the comfort of hot meals prepared with love. In sum, We Fed an Island is a heart-warming story of how a small organization under determined and knowledgeable leadership can do far more to provide genuinely humanitarian and timely food aid than hidebound bureaucracy. It is told with empathy and palpable energy but not in a self-congratulatory way. Rather, the narrative seethes with frustration and outright anger at a system that does not even see people as humans beings in distress but as fodder for the aid business, in this case as second-class Americans undeserving of the federal government’s best efforts. It is a clarion call for reform of a broken, wasteful, and heartless model of disaster relief that is self-serving rather than at the service of humanity.